Malik Mazhar Abbas Raan son of Haji Karam Khan was born on February 1, 1953 at Multan. He graduated in 1978 from Government College, Bosan Road, Multan. He was active in student's politics and was President Students Union in his college. A landlord, who functioned as Advisor to Chief Minister in 1996 and served as Member, Provincial Assembly of the Punjab during 1997-99 and 2013-18. He has returned to Punjab Assembly for the third term in general elections 2018. He has travelled to China and UK. 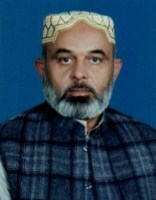 His son, Mr Atif Mazhar served as Nazim, Local Government during 2005-2010. Ward No.12, Defence Colony, Qadir Pur Raan, Multan.